Apple is no longer offering the “Genius” feature as a way to surface and discover new mobile applications in the iOS App Store in the latest version of Apple’s mobile operating system, iOS 7. Instead, the spot that used to belong to “Genius” now goes to “Near Me,” a new feature demoed during yesterday’s keynote at WWDC, which recommends apps based on your location. This is a significant change from iOS 6, where the “Genius” option not only had a button at the bottom of the iOS App Store’s homescreen, it was also the button directly in the center – the one that invites users to tap it first. App recommendations have been a tough business for many third-parties, and it seems that even Apple, too, is still experimenting with ways to make those recommendations more useful. But by introducing “Near Me” in favor of “Genius,” Apple has essentially given up on offering more personalized recommendations to users based on their preferences, and instead is providing only generalized app recommendations based on a user’s current location. During the keynote, for example, the “Near Me” feature was demoed in the context of someone who is traveling. And certainly, launching the iOS App Store to find apps for nearby hotels, restaurants or attractions will be handy at certain times. But this isn’t an everyday need, so it’s curious why “Near Me” still gets the center position in the new store. After all, most users looking for new apps hit up the charts or the App Store’s Featured section, where algorithmic and curated lists like “What’s Hot” or “New and Noteworthy” offer better selections. More Opportunity For Discovery Services? The removal of “Genius” for apps comes at a time when Apple has been cracking down on alternative app discovery resources. In recent months, Apple has been accused by some – mainly the afflicted – of shutting down discovery services like AppGratis and AppShopper (the latter which later returned after changes), as if under some blanket policy designed to bring all tools for new app discovery in-house. But that’s clearly not the case – if anything, the removal of “Genius” for apps now gives third-parties more opportunities to step in and try to fulfill users’ needs. 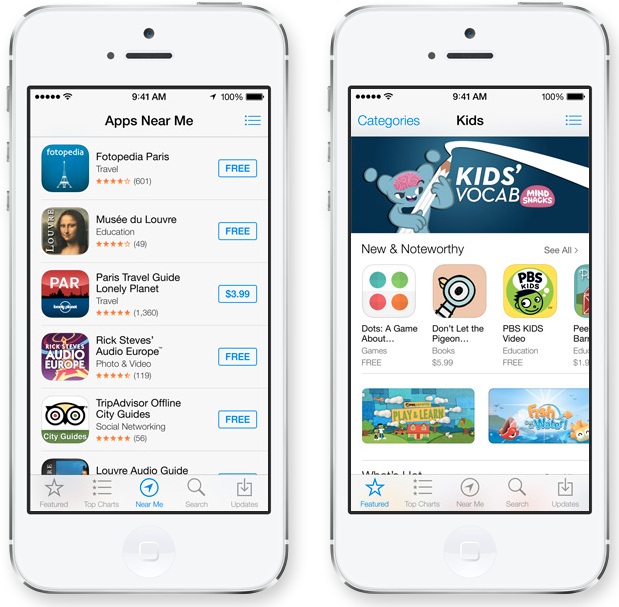 Apple’s policy against app discovery services, first enacted last fall, is there not to disallow these services, but serves as a warning to developers who are attempting to manipulate App Store charts for profit. The guidelines may have read that apps recommending other apps besides the developers’ own “would be rejected,” but Apple is using that clause to selectively dismiss those apps it knows are breaking the unspoken rules. Other apps operating safely in this space include longtime app discovery source Appsfire and relative newcomer Hubbl, for example, neither of which have experienced the same troubles. In fact, Hubbl co-founder Archana Patchirajan tells us that their newest app update was approved in just three days for App Store release. The app recommendations market has seen some upheaval, and not just because of Apple’s rejections. Some of those operating services in the space, like Crosswalk for example, have since pivoted to other businesses while others shut down. Many that remain are still niche players. Apple itself hasn’t made any public moves, until now with the debut of “Near Me,” to offer any sort of new take on app recommendations. And it hasn’t acquired any startups the way it once did with Chomp in order to better understand the challenges and possibilities in app recommendations. But at least it has admitted by the removal of “Genius” (for apps – it’s still there in iOS 7 for Music), that its earlier system just didn’t work. Appsfire co-founder Ouriel Ohayon thinks that Apple’s version of recommendations had never resonated with users because “both the experience and the recommendations were not that relevant,” he says. “Apps were mostly recommended based on what you downloaded versus what you really need and like (taste-based). What you download is not a signal of what you want next. Discovery is more than that,” Ohayon adds. Users also probably didn’t see the need for “Genius” since they were already turning to the charts for Apple’s recommendations. And when they were looking for apps similar to those they have already installed, the “Related” section within each app’s listing page serves that purpose – and it remains in iOS 7, too. Like myself, Ohayon also questions “Near Me’s” now prominent position in the App Store, which seems to be an indicator of just how much Apple is struggling to figure out personalized recommendations. “It is not a natural way of thinking. It is probably a good secondary discovery mechanism which could have been part of Genius,” Ohayon says. Patchirajan agrees that Apple’s “Genius” mechanism had long fallen short of app discovery’s potential because what really works for personalized recommendations is a combination of several factors, not just a focus on “people who like X also like Y,” or your location, as “Near Me” now calls for. Instead, a recommendation algorithm should look for a number of other signals too, including apps users own, users’ social profiles, users’ interest profiles, and situational awareness. “You need to have rich meta data around apps – just the category and keywords about apps is not enough,” says Patchirajan. Though developers running businesses in this space will be biased against Apple’s own capabilities with regards to app recommendations, the broader consensus among those we’ve spoken with in the industry is that the removal of “Genius” won’t have a major impact on developers, in terms of having apps found by users and then gaining higher rankings. App downloads are still largely powered by Apple’s charts and Featured sections, not its experimental recommendation sections like “Genius,” and likely not the forthcoming “Near Me,” either. From what we’re hearing in terms of app store SEO (ASO, as it’s often called), not much has changed in iOS 7. Search appears to be basically the same from cursory glances. (Research into keywords and algorithm improvements will take some time). For developers, unfortunately, it looks like more of the same. Apple has reached 900,000 iOS applications, but its $10 billion in revenue paid to app developers is increasingly being concentrated at the top of the charts. Only 2 percent of the top iPhone publishers in the U.S. are newcomers, as it becomes harder than ever to break into the top charts. Apple will eventually have to figure out a better recommendations system if it wants to cater to the ever-growing number of app developers who are still launching new creations in the hopes of being a part of the App Store gold rush, which is showing no signs of slowing down. If it does not, those developers could turn their focus to Android. Google Play today growing at a faster rate on both downloads and revenues than Apple’s App Store, having jumped from 19 percent in total app revenue between it and Apple’s App Store last November, to 27 percent this April. Google Play also offers a larger consumer market share, and a slightly more welcoming platform for newcomer developers. However, the store has historically struggled to generate revenue for its developers, something which Apple CEO Tim Cook pointed out yesterday referencing a number of data points indicating how much more engaged iOS users were with their devices. But at the end of the day, Google/Android doesn’t have to have its entire user base obsessed with their phones – it just has to grow its user base large enough to drive a significant number of downloads, then payments and revenue for developers will follow by nature of its size and scale. Meanwhile, keeping Apple’s app-dicted users with a steady stream of new apps to try will become something that Apple can’t leave to occasional tools like “Near Me” and its App Store charts forever.